This applies to my knitting too. I was knitting long before it became a cool thing to do. I still haven’t made a messy bun hat, and I’ve avoided blanket sweaters and tape yarn and any number of other yarny bandwagons that have swept through. I’ve had other projects on my to-do list, and I wasn’t going to drop what I was working on to follow a trend. So this project was not something I expected to make. Once I finally decided to make a blanket sweater, I had to settle on a yarn, which led me to Lion Brand Fast Track. 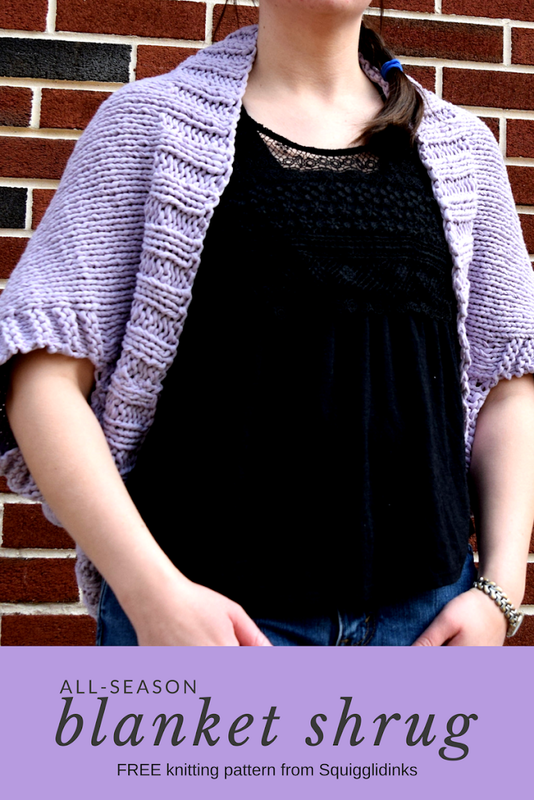 I liked the idea of a bulky yarn for the fast knitting, and for warmth in cooler weather. But Fast Track is also cotton, so it’s cool enough for warmer weather too. I’ll pause here to say a big thank you to Lion Brand for providing yarn support for this project, which means I got the yarn to design this blanket sweater for free. But, of course, all of the opinions I’m expressing are still 100% my own. I love the feel of the Fast Track yarn and the resulting knit fabric, and I’m glad I gave it a try. But to be honest, I’m probably not going to use tape yarn often. I don’t like knitting with it much. It twisted a lot, and I kept having to stop and untwist it. It got really frustrating. I was glad to get back to plain, ordinary yarn again afterwards. A couple of other notes before the pattern: First, I didn’t block this. I know, I’m setting a bad example, but this came to about the size and shape I wanted it without blocking, so I didn’t bother. 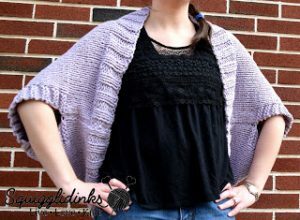 Second, this is the right size shrug for what I wanted, especially for summer nights, or for spring/fall. (Plus, I expect it to stretch the more I wear/wash it.) But if you’re looking for something bigger, cozier, and snugglier to keep you extra warm in freezing winters, check out some of Mama in a Stitch’s blanket sweater patterns. (Her designs were the first blanket sweaters I ever saw, and were a source of inspiration for my own design.) She has a number of beautiful patterns, both knit and crochet, that look so perfect for curling up with in front of a fire with a cup of cocoa. In the interest of full disclosure, the above link will take you to the Lion Brand website, since they were so awesome as to provide me with yarn support for this project. But their site may not be the least expensive place for you to buy this yarn, so you may want to check other retailers before buying. 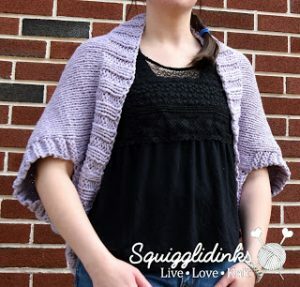 If you wanted your shrug to be more winter-oriented and you weren’t interested in using tape yarn, you could substitute another bulky yarn, like Hometown USA or Wool-Ease Thick and Quick. Any time you make substitutions, though, check your gauge to make sure your final size comes out accurate. Joining tape yarn—I found this great video tutorial for joining tape yarn. If you’re new to the yarn and you want to give it a try, check it out! You could still join it like regular yarn and sew the ends under, but I didn’t think it hid the ends as well, personally. First 10 rows: k2, p2, repeat to end. Knit next 16 rows in st st (knit all odd rows, purl all even rows). Repeat these 4 rows a total of 17 times. Knit 16 more rows of st st.
Next 9 rows: p2, k2, repeat to end. 10throw: bind off in p2, k2 pattern. Sew ends under. If you would like to block your sweater, this is when you would do it. Fold the rectangle so that the wrong side is out. The fold is at the top of the photo, halfway through the arm hole section, and the two sections of ribbing (the cast on edge and the bind off edge) meet at the bottom of the photo. Whip stitch along the side, joining the two sides, from the cast-on edge to the beginning of the arm hole. Repeat on the other side. Turn shrug right side out. Put arms through arm holes and get comfy!